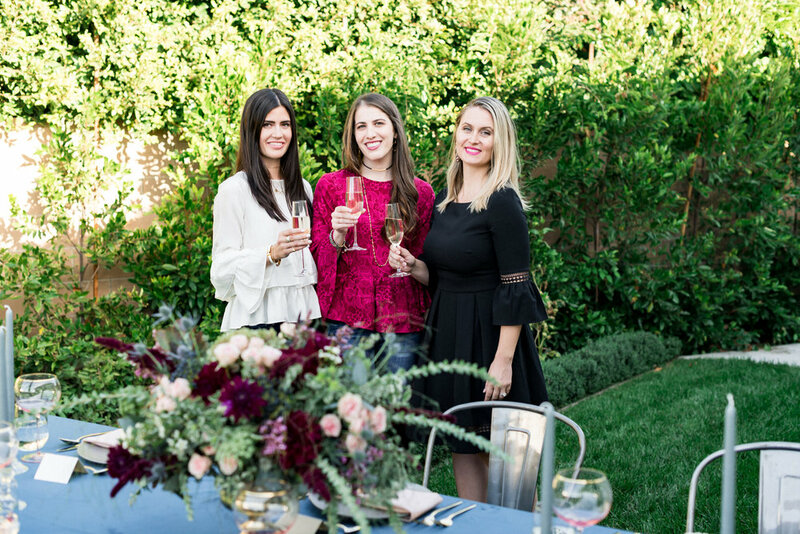 My sister Erica and I teamed up with Brooke Reagan of Brooke du jour to throw our dream fall dinner party (Kara took the beautiful photos!). We all came to the inspo drawing board with one word in mind—"dramatic." This translated to a moody table of midnight blue, dusty pale pink and touches of burgundy. We wanted something a little unexpected and veered away from the traditional fall-leaf colors for the tablescape; instead, we tied in the autumn vibe with the mini white pumpkins on each plate. 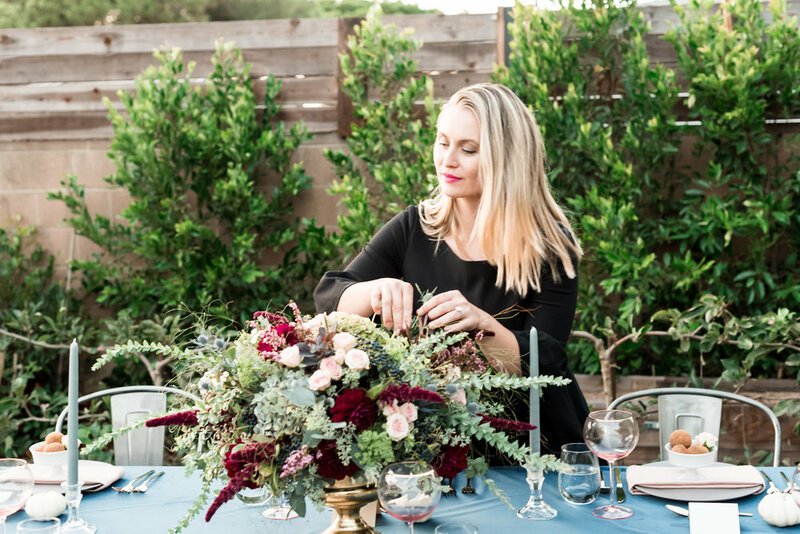 For the table, I designed a wild and whimsical floral centerpiece filled to the brim with antique hydrangea, burgundy dahlias, pale pink spray roses and accented with soft gray-green foliage in unique shapes and textures like seeded eucalyptus, knifeblade and even emu feather grass. Finally, the arrangement was studded with blue viburnum berries, blue thistle and deep red amaranthus. 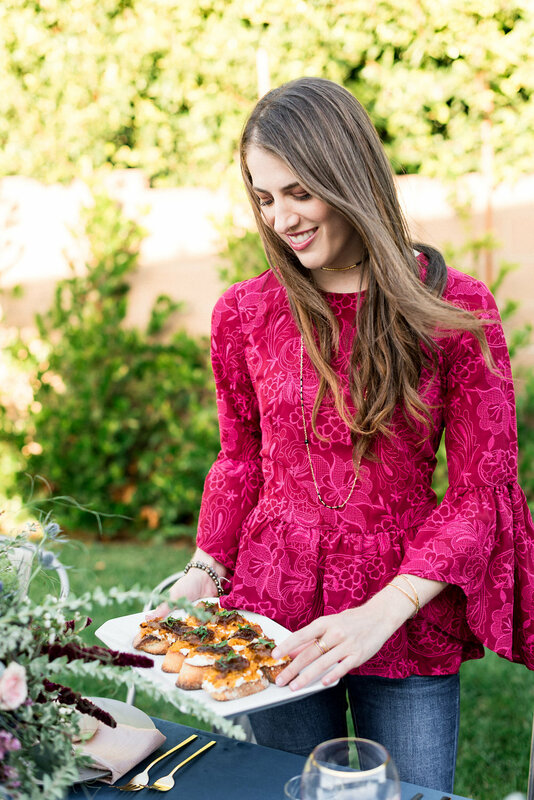 Atop the navy velvet tablecloth, each place setting was set with a simple gray ceramic plate, gold flatware, a slightly textured blush-hued napkin and festooned with a mini white gourd. Perfectly pink wine glasses added that extra pop next to the clear stemless wine glasses, and pale gray candlesticks rounded out the table. PS: Love Brooke's idea for the mini pumpkin-turned-dip dish. So cute! The menu was entirely pumpkin-themed—but we opted for pumpkin substitutes (butternut and acorn squash) were it was more practical. 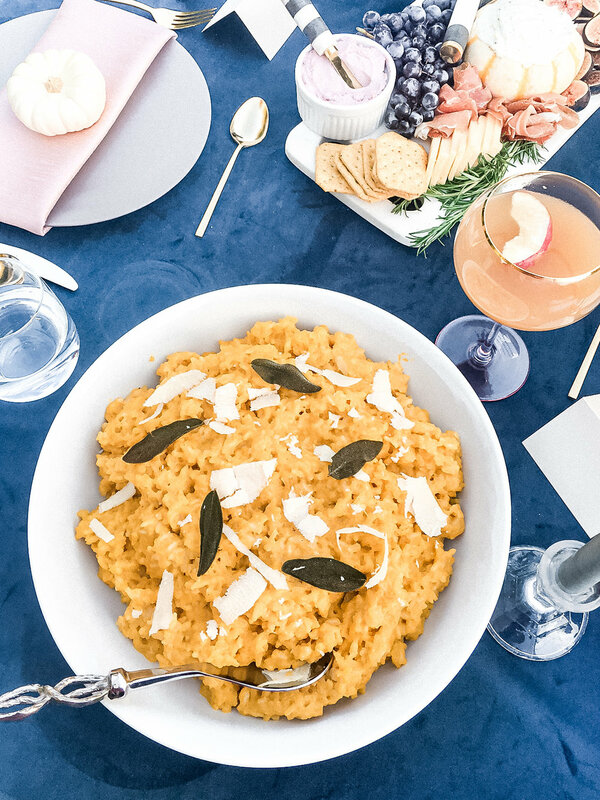 We started the night with these always crowd-pleasing toasts topped with butternut squash, ricotta and caramelized onions (seriously yum) and a cheese plate because who doesn't live for a good cheese plate/charcuterie board? Well, I do at least. Next we served pumpkin risotto with an arugula salad filled with roasted acorn squash, pomegranate seeds and feta. For dessert we couldn't ignore the most fall-ish flavor of them all—so we made some pumpkin spice donut holes! Tipping the scales was the pumpkin punch. Do you think it's possible we even out-pumpkined ourselves? All in all, it was a dreamy scene of muted tones with dramatic flare. Even my son, Jackson, made a cameo (in his pjs!) 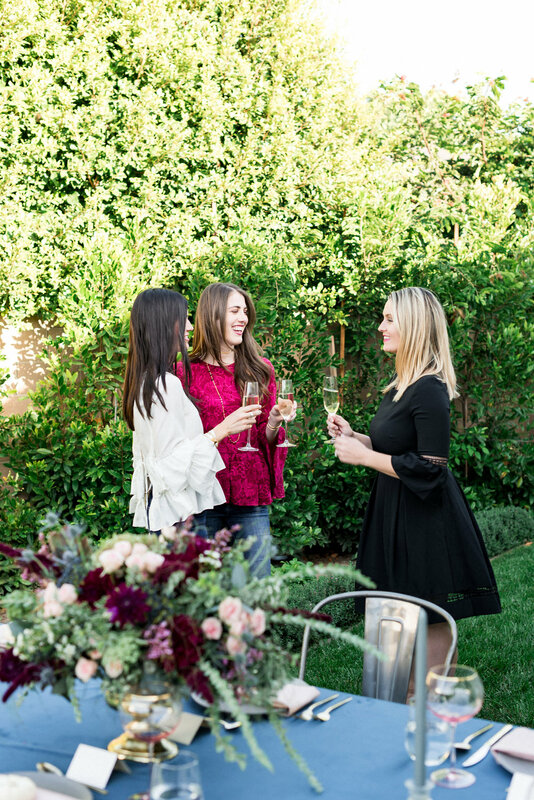 at our soiree. Can't wait to do it again!